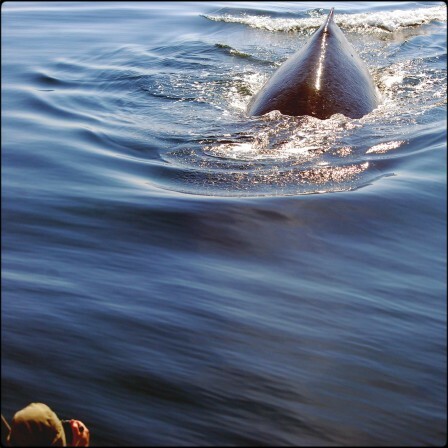 Close encounter with a whale | Northwest Navigation Co. Some days are simply perfect. The weather’s warm. The skies are blue. The water flat calm, and the line between sea and sky is almost indistinguishable. We had a day like that in August. It was the kind of day that happens every-so-often in the temperate rain-forest climate of southeast Alaska. It was the kind of day where all the conditions were just right for watching humpback whales. Not only could we stop to watch, but we were able to turn off the engine and drift silently. Without background noise from the boat, we were able to experience something different. 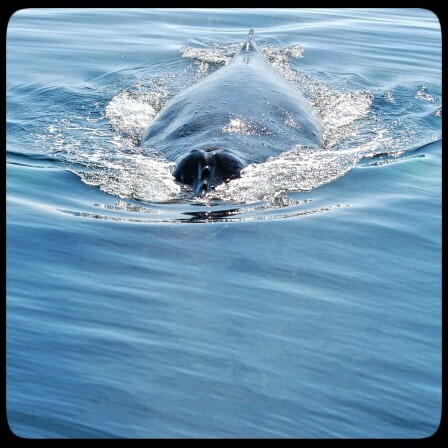 All around us, and spread out over several miles were humpback whales in groups of two or three, and alone. All foraging. When they would surface, their breath would make an explosive “swooshing” sound. Atomized water particles hung still in the air marking the spot where they had come up. It was hard to know where to look. The sounds of whales surrounded the boat. They would sometimes surface near to the David B. Other times they’d be distant. We just drifted upon the open water; watching, listening, observing. Our only real plan for that day was to anchor in the evening somewhere at Admiralty Island or Baranof Island. We didn’t have any concrete plans for the day. Having an itinerary means you have to get somewhere, and when nature presents something beautiful and awe inspiring to enjoy, an itinerary means you just have to put on your blinders and keep going. So there we were, sitting around listening to whales. We’d also dropped a hydrophone (an underwater microphone) over the side. The small amplifier on deck that the hydrophone was plugged to revealed all kinds of whale sounds from funny-bawdy to ethereal. From my spot on deck, I could see couple of whales surfacing about a quarter mile away. It soon became evident that they were heading our direction. Everyone on deck turned their attention to these whales. They moved in a straight line. We watched. Each time they broke the surface, they were closer. Soon, one whales was close enough to see it under water –it’s long pectoral fins faintly glowing against the deep dark water. Over the amplifier, a couple barking sounds and some bubbles could be heard. Then a few seconds later, a whale surfaced just off our starboard side. It lifted it’s fluke high and dove under the boat. Farther aft, the second whale surfaced and dove as well. There was a moment of joy, then wonder. I wondered why they chose that path? Where were they going? What did the sounds mean? How long would they remain under water? Where would they surface next? Please note – For full screen click on video, then click on” [ ]” in lower right corner.